Immediately after its discovery in 1895, X-ray radiation started to make an enormous contribution to the study of artwork. X-ray radiography, MA-XRF scanning and X-ray tomography have been of great help in the understanding, preservation, and authentication of works of art. Notwithstanding major developments over the past century, there are three important intrinsic limitations to X-ray tubes - the conventional X-ray sources used in the lab: their relative low intensity, the poor coherence of radiation and the selective availability of X-ray energies. Since the late 1970s synchrotron sources have become available, which offer high-brilliance, coherent and energy-tunable X-rays, but these are only available at a limited number of specialized facilities worldwide, providing scarce beam time – at a high cost – outside the museum lab. This contribution will discuss the future development and application of a revolutionary, compact, affordable and miniaturized alternative to a synchrotron facility – a tabletop Inverse Compton Scattering (ICS) source: Smart*light. The physical basis is the ICS process in which photons from a laser beam are bounced off a relativistic electron beam, turning them into X-ray photons through the relativistic Doppler effect. Already described theoretically decades ago, the enabling technology necessary to materialize such a source, has only very recently matured into robust components. Ultra-low-emittance electron guns, compact X-band accelerator technology and highpower pulsed lasers have become available only recently. This now brings the ICS source for in-situ applications of high-energy X-rays within our reach. In combination with the newest X-ray detectors (Medipix) the tabletop ICS source will constitute an extremely sensitive, on-site, non-destructive tool for imaging and analysis. It will combine (sub)micrometer spatial resolution with high analytical precision in structural and spectroscopic applications. We plan to use the ICS source where it will be most effective: in the museum conservation studio for the study of important artwork. 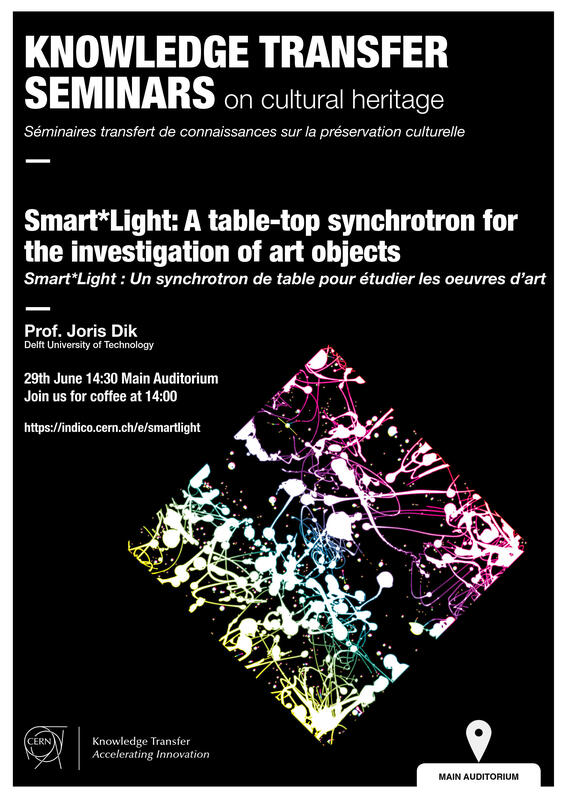 This lecture will discuss the development and the potential of smart*light for the study of artwork.